Hindsight is always 20/20. It always seems easy to share ideas for how to handle a terrifying, traumatic situation ahead of time versus when the situation suddenly arises and you’re in the heat of the moment. 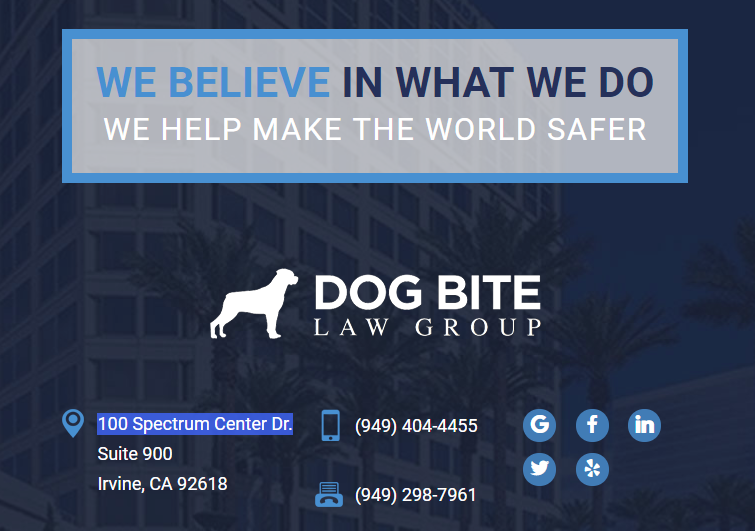 Our Irvine County dog bite lawyer at the Dog Bite Law Group understands that this is not reality, but our hope truly is that we can help find a way to minimize if not eliminate these tragic situations from every vantage point. Even though folks put on the spot with an attack likely won’t remember everything with regards to handling it, remembering even one idea may help in dealing with a dog bite. We’d like to help those that have been attacked have the tools to try and help with a potential dog attack in the future. Below you’ll find ideas regarding what to do and things to try and avoid when dealing with a dog bite attack. If you have been injured in this type of an incident, contact the Dog Bite Law Group as soon as possible to schedule a free initial consultation. We hope this helps, to the degree it can in the moment. Try and put yourself on alert that the dog you’ve encountered is in a state of mind that could lead to an attack. The dog may be aggressive or defensive, depending on the situation. Generally, a dog will bite when it believes it is dealing with an imminent threat. Avoid making eye contact with the dog. Turn your body to the side, as this makes your shape less threatening. Be still for a short period of time and then slowly move away from the scene. Try to find a place that presents a barrier between you and the dog. Hopefully, these steps will help you both recognize an impending dog attack and try to avoid one if the dog becomes aggressive or defensive. Unfortunately, dog bite attacks can still occur. Turn your back to the dog. Do not expose your face to the attacker. If it takes you to the ground, roll up into a ball and fold your hands behind your neck. Try to “feed” the dog something, such as your jacket, a shirt or something to distract it. There is no surefire way to either avoid a dog bite attack or to make one stop. Most likely, you are not going to simply overpower a dog that attacks you, especially if it is able to take you to the ground. Instead, hope that the dog loses interest in you quickly or help arrives promptly. As unrealistic as it sounds, try to remain as calm as possible. Obviously, this is all happening quickly, within seconds. When dealing with a dog bite, fear can lead to panic, and panic can lead to heightened aggression from the dog. Dog bite attacks are terrifying situations that no one should have to endure. We hope that these incidents become a thing of the past where owners properly care for their dogs and people aren’t put into an emergent situation to react to a dog attack. Unfortunately, dog bites and attacks do occur and people who have been injured need to be able to protect their legal rights and options. If this includes you or someone you love, seek the help of experienced California dog bite lawyers who have been dealing with a dog bite and the injuries associated for several years. Contact the Dog Bite Law Group today to schedule a free consultation.